You need to wow your clients, and potential customers, from the very first moment that they step onto your grounds. Your grass, hedges and plants say a lot about your company. Have grounds that are as smart as your business. Make those first impressions count. 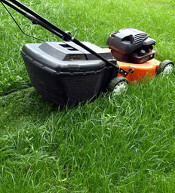 Town & Country Grounds provide a full maintenance service to our commercial clients, including lawn and grass maintenance, seeding, fertilisation and mowing. Hedges and shrubs are pruned, planted and removed. Your grounds will be one less thing for your business to worry about. When your grounds are tidy, your workers will be invigorated and ready to work from the moment they arrive. We ensure that your grounds never become unsightly. Leaves and litter cluttering up your walkways will be a thing of the past. Weeds will be blitzed. We even sweep up and remove discarded cigarettes from smoking areas.